For those of you who are already familiar with the paradox and want to move straight to the solution and skip my sarcastic nonsense, please click here. Today I read about Hilbert’s paradox of the Grand Hotel (shame, only today) and I was struck by the illogical human thinking. Paradoxes are nothing but illogical thinking. When for some stupid reason we create infinite sets, we create them from objects with the same properties. Right? We can have an infinite set of apples, or an infinite set of shoes, or an infinite set of shoe pairs. What do we have in Hilbert’s case? We have an infinite set of hotel rooms, all of which are occupied by guests. What we actually have is an infinite set of room/guest pairs. But according to Hilbert’s choice of words, we have hotel with a countably infinite number of rooms, all of which are occupied. Now we have to accommodate one guest in that hotel. It appears that if we choose to think of the occupied room as of room + guest, we can move the guests with one room up and vacate room №1 for the new guest. Well, apparently Hilbert has a good explanation; since the rooms are infinite, there is no last room which will block the guests’ movement with one room up. So, it is possible, although it contradicts the idea that all rooms are occupied. Mentioning „all“, don’t you think that this word is inappropriate when it comes to infinity, because „all“ implies a number, but infinity is not a real number. „Not a real number“ is the first step for creating a paradox. How many unicorns can we accommodate in fully occupied unreal number? The answer could be any real and unreal number and it would be the right answer because you can adjust the unreal parameters in any convenient for you way. But isn’t there any way to make sense of this and put it in a logical explanation? Can we refute the illogical statement that infinite number of occupied rooms can accommodate one and even infinite number of guests? Sure, there is nothing easier than refuting a paradox. The logic for a limited set of numbers tells us that we cannot create a pair in a row of room/guest pairs by adding only a guest in that row. Simply said, we cannot accommodate a guest when all the rooms are occupied. As Hilbert tells us that’s not the case with the infinite number of occupied rooms. Then let’s change Hilbert’s choice of words! Let’s accommodate the cement in the bucket of water in the same way we accommodate the guests in the empty rooms. Now we have an infinite number of concrete buckets. To make it even easier, you can use an infinite number of 10L buckets filled with 10L of water, and try to add 10L water from a plastic back in the infinite bucket-water pairs. Infinite number of pairs still means 50% room items and 50% guest items. Now add 1 item to one of the sides and the percentage changes, making the room items under 50%, which leaves no room for the 1 item added in the infinity of the 50% guests. So much for the infinity, which when put in percentage cannot take even one more item. Look at the stars. They are only 4% of the universe. We have 96% empty space and only 4% matter. Imagine that there are 50% matter and 50% space in the infinitely large universe. Do you think that it would stay 50/50 if we put 1% more matter in it? You see now? Infinity is not infinity when measured in percentage. You didn’t think of it, eh? Imagine that we fill all that empty space in the universe with matter. It would be infinity of matter. But after we filled up the universe with matter, can we put one more electron in it? Ahaaa! Because there is no such thing as INFINITY. Now, back to the paradox. It would be a different story if we had infinite number of rooms and infinite numbers of guests waiting to be accommodated. Before you accommodate the guests you can bring a whole lot of infinite guests, and there will still be enough rooms for them, but once we put them in the rooms, we change the property of the infinity to infinite number of pairs. Now, you cannot put a single guest in that hotel. It doesn’t work that way, you say? Oh, I see, you prefer unicorns. So, where the paradox comes from? It comes from the concrete, of course. Hilbert wasn’t clever enough to see the real property of „occupied room“. He saw it as 1+1. But it actually is 1. Now you can tell me that the logic of mathematics allows you to do pairing and mapping and blah-blah, and all the blahs seems to be logical, but if there is a paradox, one or all of your blahs are nonsense. And by the way, mathematics is not logic, but tool to prove logic. It is a way to frame your thinking in order to prevent nonsense slipping out of the cage. This condition sets the three points bellow. 1. If we „vacate“ a room, we cannot use it for new guest unless we brake the infinity. How so? Because ∞+1=∞ rooms, and we already have infinite number of guests on the other side of the set (50/50 ratio is still present). Hence the conclusion that although it seams that we have an empty room we don’t really have one, because the number on both sides is always equal – infinite. 2. Not taking in account the above, we actually make the number of the hotel guests finite (if there is empty room it is because the guests are finite) which automatically makes the number of the occupied rooms finite + 1 empty room. Now the number of the rooms is with 1 greater than the number of the guests and we can accommodate one guest. But in this case we don’t work with infinity, do we? 3. We can ignore point 1 and use the obvious argument against point 2 (which would be wrong) that after we move the guests we end up with infinite occupied rooms and one empty room in the hotel (!) 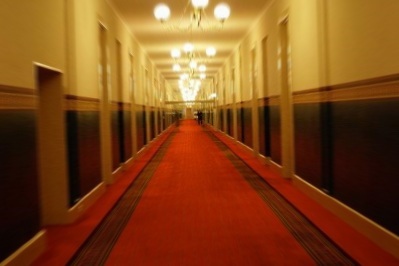 Well, here is the fallacy – the hotel is defined as countably infinite number of rooms, all of which are occupied. Let’s lose the “hotel” word which is deceiving and let’s use “infinite set of pairs”. If we have one element which is not paired, does it belong to the set? Of course not. So, the “empty” room does not belong to the hotel because it is not a member of the set of pairs. And this is what I call the “language deception”. The “hotel” word is bringing deception. Let me explain it in a simpler way. What happens if we move the guests with one room down, instead of moving them up? The guest from room №1 leaves the room, and the room is taken by the guest from room №2, the guest from №3 goes in room №2, the guest from №4 goes in №3 and so on (it is the opposite of vacating a room) Now one guest is out of the hotel because he doesn’t occupy a hotel room. Is this person part of the hotel guests? Of course not. So is the case with the empty room – it does not belong to the hotel. Instead of moving the guests with one room up, lets move the rooms with one down. It is essentially the same action but put in a different wording. Now you can see that we actually take one room out of the hotel by moving the guests with one room up. a seemingly absurd or contradictory statement or proposition which when investigated may prove to be well founded or true.